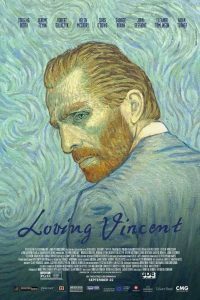 Outdoor Movie Night “Loving Vincent” – Bring a picnic and come early to enjoy the Museum gardens prior to showtime. The life and controversial death of Vincent van Gogh told by his paintings and by the characters that inhabit them. The intrigue unfolds through interviews with the characters closest to Vincent and through dramatic reconstructions of the events leading up to his death. Loving Vincent features 120 of Vincent van Gogh’s greatest paintings.